We guarantee that ALL Brooks Chimney Sweeping technicians are legal U.S. citizens. Making your hearth experience all that it can be. Your chimney, fireplace, wood stove even your dryer vent are among the most overlooked systems in your home. Conditions that make these systems operate less than favorably can be remedied, making your time in front of the hearth that much more enjoyable. We at Brooks Chimney Sweeping are dedicated to making these systems within your home operational and reduce the hazards often associated with their use and educating you on the importance of hearth safety and performance in the future. It’s been our mission from the beginning so you can trust us to provide accurate information and excellent service. From your initial phone call to our office to secure an appointment through the final completion of your chimney being swept and or inspected, you will find a courteous and professional staff that will be happy to answer any of your questions. During the booking of your appointment, be sure to share with us any problems you have encountered with the chimney and alert us of any special concerns or requests you have. 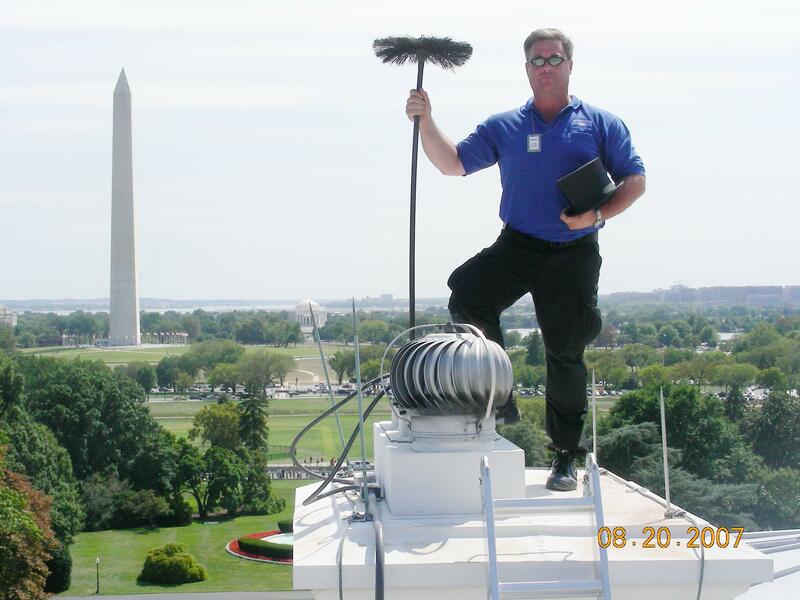 Randy Brooks on chimney in D.C.
We service flues all over the United States.